Shop Kroger's perfect products of weekly food. 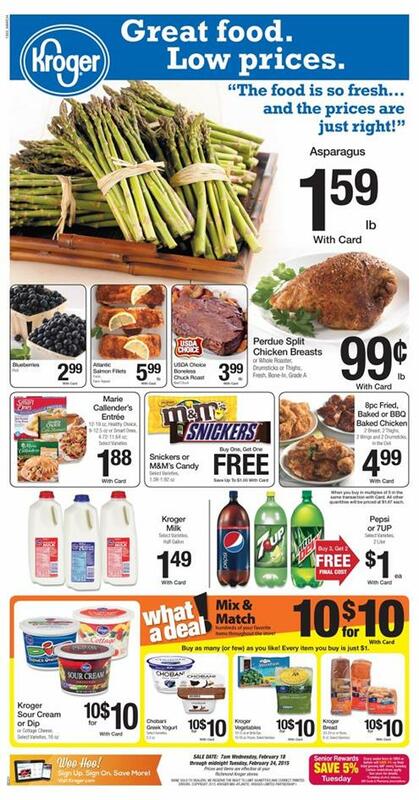 Kroger Weekly Ad 8th April 2015 is published. You can browse whole sale with simple preview. Meat, fresh food, beverage, snacks, chocolates and many more weekly shopping items are mainly featured products of Kroger Ad. On cover page some of the meat products and fresh food like fruits are available. New prices are effective until 14th April. Kroger cheese $2.99 with card. Fresh produces and organic fresh food products of Kroger are available on pg; 2. Check the deals to shop at best prices you can find. 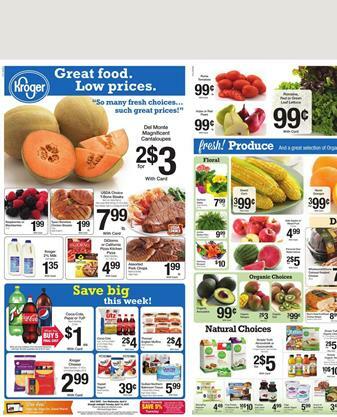 Kroger Weekly Ad 8th April offers watermelon, oranges, corn, mangos, avacados, kiwi on fruit aisle. Kellogg's Cereal 2 for $7 with card. Kroger Ad is also a place to find outdoor products in this week. 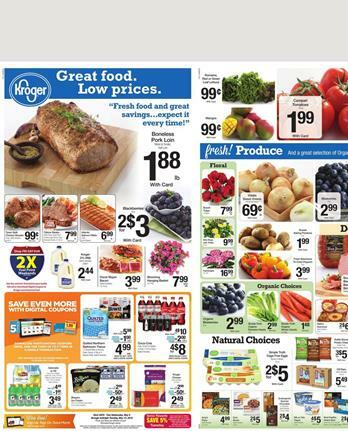 Find outdoor range of Kroger on latest page of the ad with dropped prices. Latest Kroger Ad prices are efficient in 11th March - 17th March 2015. Spectacular selection of Kroger ad each week makes me a customer of it. Find new snacks, meat, fresh food, fruits, vegetable, beverage, organic food, deli and bakery popular products of the latest Kroger weekly ad. Now you are able to find preview of what Kroger Ad presents for you. On the preview page full sale of the retailer is available. It is easy to browse new preview. 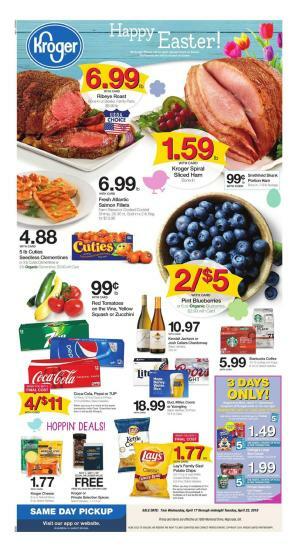 Kroger Weekly Ad Food 11 March valid prices will make you love this shopping. Please go to pg; 3 for the meat products. Butcher shop of Kroger offers a lot of products. Extremely delicious and healthy variety of meat products are available at Kroger. Check out these natural products and organic food on pg; 3. See many more products of Kroger for meat department. See deals to save more. Drinks, side dishes and various snacks are discounts of Kroger this week. New deals for special day are available on the Kroger ad. Kroger boneless corned beef, $4.49 lb. Mix and match sale, snacks to be fun with new basketball matches, fresh products and dozens of more of the Kroger products can be your options to save and fulfill the needs of your weekly shopping. Also see new Kroger Easter products including Easter eggs. Easter chocolates and similar sort of items are featured. 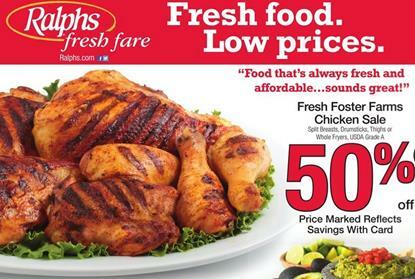 Latest Ralphs fresh food sale is available now. You can go to official page to view new Ralphs ad with the full sale. Fresh produce products, buther shop, deli products, special deals for baby care products. Ralphs organic products are also new sale of this week. Super savings are on the cover page. Fresh produces of American farms are at their best form with the organic sales of Ralphs. 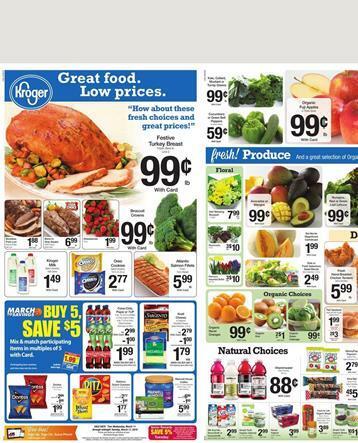 Kroger weekly ad was also published in few days ago. Check out these two ads to discover good prices of fresh food. Kroger Fresh food deals are attractive but it also got a nice new sale of baby care products. For healthy food, essential food and best quality you can always prefer Kroger ad. Kroger ad offers fresh produces like these on below. Deli, bakery, meat and fresh food including organic food are similar to those on the Kroger Ad. Check out more detailed information on the pg; 2-3. You must go to official page of Ralphs to see new products. Kroger fresh food deals February is available to view full product range of the supermarket. Check out new products of Kroger Weekly Ad fresh food items which can be seen on pg; 2. Kroger stores drop the price of fresh food varieties. Organic products are also featured on the new section of Kroger Stores. Find out Kroger Weekly Ad preview. Dairy products, organic milk, nutritional products and similar seafood. All Kroger ad products can also be found on the preview. * Wild Planet Albacone tuna. New meat varieties are featured on new ad. Kroger Weekly ad is also popular for its meat products. We are able to save on a lot of products appearing on new Kroger ad. * Boneless Strip steak, $7.99 lb.